One of the most common medical complaints seen in dogs is skin related. Unlike humans who react to allergens with nasal symptoms, dogs react with skin problems. These problems may range from poor coat texture or length, to itching and chewing, to hot spots and self-mutilation. Allergies may also play a part in chronic skin conditions. These are caused by possible allergies in the environment, for example grass or pool chemicals. In this case it is very important to try to avoid the known allergies. Before you can avoid them you need to be aware of them by carefully watching your dog’s habits and noticing when any flare ups occur. Food allergies are very common in dogs and are often due to a poor diet. It is very important to ensure that your dog is eating high quality food and if need be an allergy friendly food. These are every pet owner’s worst nightmares: fleas, the biggest leader in causing itching and scratching. A good tick and flea prevention, such as advantix® and FRONTLINE® will help to avoid this problem. 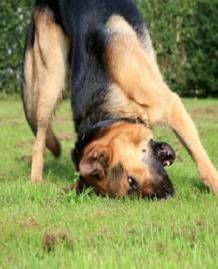 Neurogenic is when all other causes have been ruled out and it just boils down to the fact that your dog licks and scratches. This can be due to stress, boredom, obsessive-compulsive disorder. Usually the dog will exhibit other behavioural symptoms too. 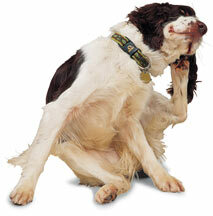 This poses a problem as the area of licking or scratching becomes raw and is therefore more susceptible to infections. Bacterial, fungal and yeast organisms are notoriously detestable skin and coat pathogens. Allergic dermatitis is diagnosed when all other possible causes are ruled out. Allergies can be to almost anything such as food ingredients, synthetic and natural fibres, medications and pharmaceutical products, plant material, pollen, plastic food dishes, furniture stuffing, ornamental plants and even dust can trigger an Allergic Dermatitis. Even common bacteria on the dog’s skin can provoke an allergic reaction to themselves. Allergies are caused by the body’s natural immune response that over reacts to the antigen (any substance that causes the body to produce antibodies). This process results in inflammation, irritation, redness and itching. While many pet owners turn to steroids and antihistamines to help their dogs or cats with skin allergies, supporting your pet's immune system may help reduce the occurrence of flare-ups and allergic responses. A strong immune system clears out allergy response cells like histamines. Omega 3 fatty acids have been shown to reduce the amount and effects of histamines that are released during an allergic response. They help to reduce inflammation and improve your pet's coat quality by creating a protective barrier in the skin to block out irritants and infections. Most dogs and cats respond well to omega 3 fatty acids with noticeable improvement within a month. Colloidal silver gel or lotion, when used in the correct dosages can be beneficial in alleviating skin conditions such as itching and scratching. Calendula mother tincture or oil is a fantastic antiseptic and anti-inflammatory. It also helps to soothe sore, inflamed and itchy skin conditions. Lavender oil also has anti-inflammatory properties. It also helps to soothe and relax. It is suggested to dilute a few drops of lavender in some water and soak a cloth in it. Then apply the cloth to the dog’s body and gently massage over it. Chamomile oil is an anti-inflammatory, antiseptic and helps to calm the skin from itching. It is also has a healing effect. When using essential oils it is important to always dilute them. Homoeopathic remedies are recommended in a 200CH potency for dogs. Each remedy has its specific indications and therefore you should select the one that fits your dog the best. Apis is indicated with immense itching and severe burning lesions. All symptoms are worse for heat, being covered and from scratching. Everything is better from cold application. There is sudden and severe swelling. Usually the patients are thirstless. Ant crud is indicated in cases where allergic dermatitis is caused by food indiscretions. These symptoms are worse for heat. Dulcamara is for violent itching made worse by change from hot to cold and wet weather. Lesions are large and burning. Urtica urens itchy blotches, burning heat and violent itching, symptoms are worse for cool moist air and touch. Sulphur is indicated when the skin is dry and scaly. There is immense itching and burning made worse by scratching and washing. Itching from warmth and especially in the evenings. Try to avoid the cause of the allergies where ever possible. Keep your dogs groomed and treated with tick and flea prevention. Also ensure a good diet with high quality food to suite their specific needs. In severe cases put your dog in a cool bath with some drops of either Calendula or Lavender oil. Is a dog a carnivore or an omnivore? - this may help you to decide what is the best diet for your dog. Dog Bites: Who Is Getting Bitten and Why? - this article gives you an understanding as to why bites occur and who is bitten the most.